The Ouch! 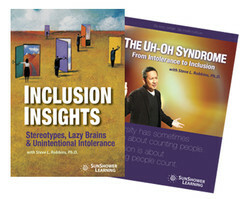 That Stereotype Hurts training program is our bestselling program. Combining the emotional impact of real stories of bias with simple to learn skills for speaking up, Ouch! is a powerful tool to help you change your workplace. Discounts will be reflected on your cart during checkout. Please note, we may require documentation to honor discount. The Ouch! program explores the impact of bias and stereotypes. 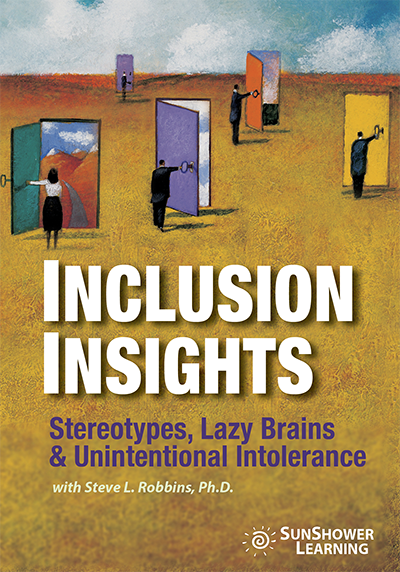 It explains why people don’t speak up against bias and stereotypes, and it helps participants learn techniques for speaking up against bias and stereotypes without blame or guilt. This is critical – no blame, no guilt trips, no making someone bad. 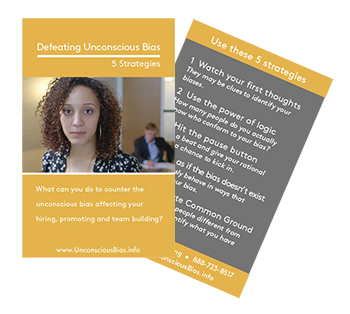 We all have unconscious bias that shows up as stereotypes and maybe it shows up in a joke or comment or email or the way we introduce a co-worker. In any case, it doesn’t mean anyone’s a bad person. Ouch! will help your people bring these unconscious biases to their awareness so that they can do something about how they communicate in the future. Reinforce it by laughing or joining in. Tolerate it by saying nothing, which is what most people do. 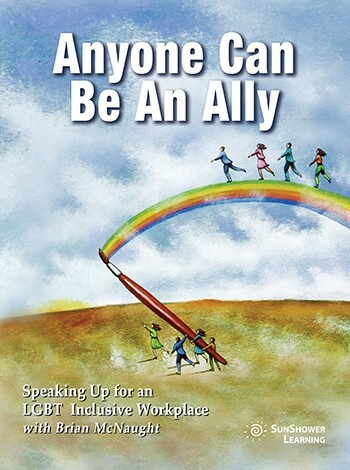 Or speak up and become an ally, the hardest thing of all. This is what Ouch! 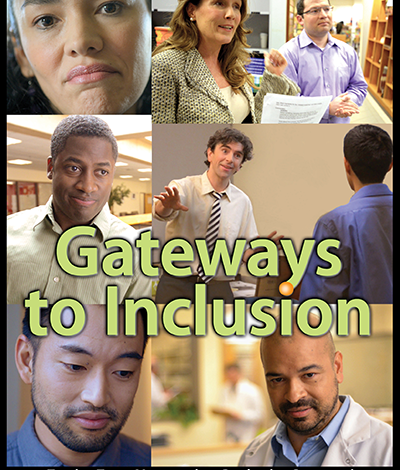 is all about – helping you create a workplace that is truly inclusive and welcoming. How else to create an environment of innovation and improvement? 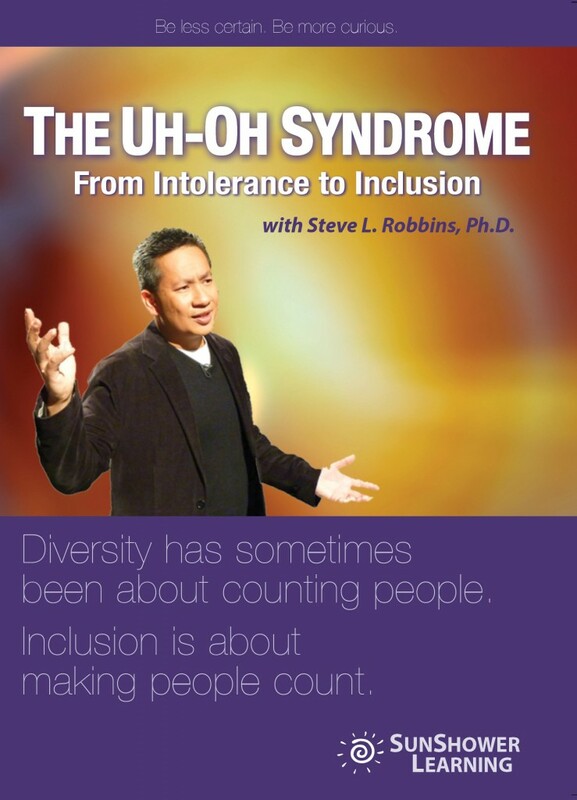 Staying silent in the face of demeaning comments, stereotypes or bias allows these attitudes and behaviors to thrive. This undermines our ability to create an inclusive workplace where all employees are welcomed, treated with respect and able to do their best work. Yet, most people who want to speak up don’t know how. So, they say nothing…. and this is where Ouch! comes in. As Daniel Goleman writes, “saying nothing serves to condone it (bias).” Biased, stereotypical, or otherwise demeaning communi-cation undermines morale, teamwork, and productivity. It can drive customers away. It can cause a public relations fiasco (just ask Don Imus or Mel Gibson). So, what can you do to speak up against stereotypes? Just say … Ouch! The OUCH! That Stereotype Hurts programs is an off-the-shelf training package designed to assist you in leading a successful training session.Why is OUCH important? Have you ever heard someone say something biased or demeaning and you didn’t know whether to speak up? Have you ever said something unintentionally offensive and wished you could take it back? If you answered “yes” to any of these questions, this video training program is for you. OUCH! That Stereotype Hurts will help you gain the skills and confidence needed to successfully communicate in a diverse world. In a direct and powerful way, you will experience the impact of stereotypical comments, jokes and emails. The program will help you explore why people don’t speak up against stereotypes and other biased behaviors. In the last section, the program offers six techniques for speaking up without blame or guilt. Would you prefer to stream this video? We offer licenses that make it easy for you to stream the Ouch video, and all our programs. Just call and we can show you how easy it is to stream Ouch on your LMS or ours. You can purchase streaming for 100 and 250 trainees right here on the site. We’ll send you instructions for how to access the streaming video on our LMS. 1 DVD or USB drive with the main Ouch! video with vignettes, the Ouch! video without vignettes, and an extra feature, Speaking Up exercise. (Subtitled in English, Spanish, French, French Canadian, Dutch, and Portuguese)1 CD-ROM with Leader’s Guide, Handouts and Powerpoint. (see below to preview)1 book, Ouch! 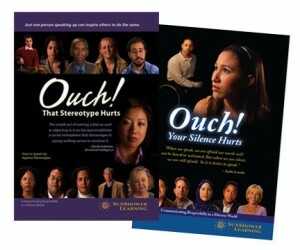 That Stereotype Hurts.1 pack of OUCH Reminder Cards (10 cards).